Appearance Haven't found a really good picture. Maybe this one. 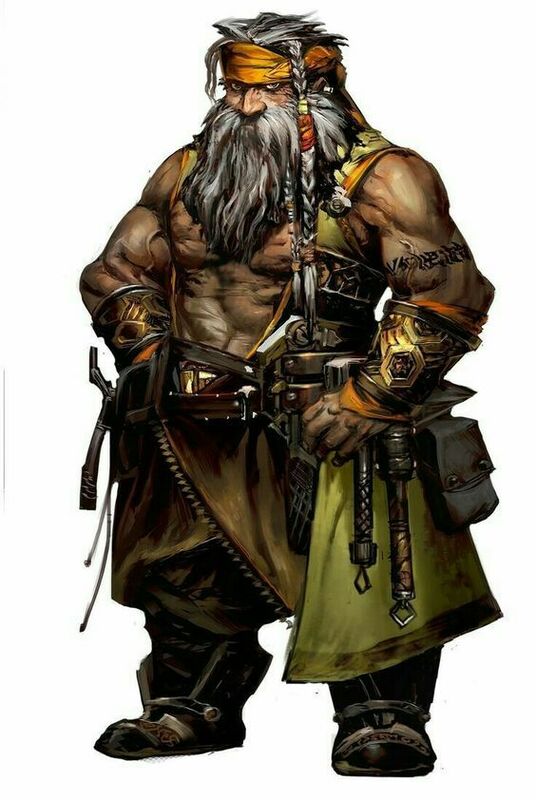 Kobak usually wears his peculiar armor: veins, pipes, switches, buckles webbing a leather structure. Complete with a wide harness at the waist holding numerous tools and pouches, and a fist size luminous oval lump at the center of the chest. Hair and beard usually unkempt and similarly to the face, smeared with soot and oil. The sole clean part of his face is only visible when he removes his large goggles covering his eyes and the upper part of his face. When not tinkering at home he carries a robust backpack that seems to live a life of its own. This ticking, clinking, sometimes fuming device functions as Kobak's mobile laboratory, safe, pantry and widget storage (occasionally, beer keg). Pockets, padlocks, gauges, intakes and exhausts cover its surface. Kobak's right arm is a brass colored artificial device substituting his lost arm and also being capable of numerous tricks while looking more or less like an armor glove. Personality Seems to be detached and somewhat reserved, Kobak is lost in his thoughts most of the time. Either tinkering or thinking about tinkering, planning experiments and trying to come up with new approaches to whatever problem. Despite that, he's friendly and open to share his ideas to whomever seems interested in hearing them. Growing up amongst gnomes he developed an optimistic and jovial view. Though he can be morose if he's stuck with a problem for too long. He speaks a little bit loud - maybe a dwarven heritage or just a habit from operating in a rather noisy environment. Background His parents used to be merchants crossing the desert with their fortified wagon. But one time just before they'd reach the safety of Yslip they were overrun by a large pack of sandwolves. The city guard came to their rescue witnessing the attack through their telescopes, but by the time they arrived Koback's parents were dead and he lost his right arm. A group of tinkerer gnomes - who were the recipients of the shipment - adopted the young dwarf feeling somewhat responsible for the tragedy. They created a basic mechanical substitution for Kobak's lost arm and shared their knowledge and affinity to magic and mechanics with the boy. Kobak was a fast learner. He soon fit in to his new family and tinkering became his life, his hobby and his obsession - especially ever refining his substitute arm. Role play sample Blue sparkles scattered over the workbench. Bright light illuminated Kobak's goggles, but the welding torch halted in his hand. Something was amiss. He switched off the device and removed his goggles. He narrowed his eyes as a red pulsating light and a buzzing siren were trying to get his attention. It indicated that someone was hitting the mission bell downstairs at the shop. He reluctantly put down his work and descended the narrow stairs, trying to get rid of the stain on his hands using a rag. Since allymaster Alzivier was forced to live in a wheelchair Kobak took over the bulk of running the small shop. Not that they had many customers: tinkerers would rather make their own tools than buy it from someone else - though master Alzivier's name was guarantee for quality. Aside from some very tricky, hard to make components, their income came mostly from selling various rat traps and dove wards. As Kobak recognized the person in front of the counter he nearly turned straight back. - "What now?" - he asked in a less then friendly manner. The crone directed her gaze at the dwarf. Her orange eyes burned with malice from under the robes that covered her body. Her wizened hand lifted a sack and dropped it onto the counter. - "Keep your faulty devices away from my little darlings!" - she complained. Kobak didn't need to guess to know what was inside the sack: the ruins of his autonomous mechatronic companion prototype (or Amecop for short). He frowned as he took the sack and examined the remains. It was in a bad but repairable shape. antagonistZeralda lived in the neighborhood with her numerous exotic and less exotic pets, like cats, pseudodragons, sentient fungi, giant bats and who knows what else. Kobak looked back at the hag. - "You should keep your _darlings_ away from other people's homes!" - he replied. The Amecop was set to guard mode when he last saw it in one piece. It must have spotted one of her pets trying to steal something from the pantry and it chased it home where Zeralda terminated its program with a broom. He was abut to voice his anger regarding the state of his device but then master Alzivier rolled in from a side door. - "Zeralda!" - he smiled - "Great to see you again! Looking for a new collar? Leash? Something else?" He caught Kobak's glance and nodded for him to go back upstairs. The dwarf turned around and climbed up the stairs silently. "Alzivier will handle this." - he thought. He never was a diplomat like the old master. He shook his head. He didn't want to waste any more thoughts on Zeralda, the weight of the sack he held reminded him that suddenly he had a lot more work to do. Last edited by Daendil; 05-26-2018 at 06:08 PM. The city itself is large enough to be unaffected by the desert all around it? @figtickler Would there be a way to reskin the pteranodon to something more common? My thought was that the character would be part of a corps of halfling mercenary scouts who ride flying mounts and are hired to find caravans and travelers lost on the hard journey from pole to pole. Mostly they would work for merchant houses in the city who have realized scheduled shipments have been delayed and would like to know what happened to them. I was hoping to have them as a faction and also an obligation that this character would have. @daenil this is very interesting. This concept works. Did you want to keep the arm purely as flavor? @davlde hmm perhaps. The only thing big enough that wouldn't attracted too much attention to mind are ostriches but they don't fly. There are falcons that assist people with this sort of thing in IRL. Obvs not big enough, but I'd allow a nerfed giant eagle. There is precedent for animals of unusual size in the setting. Bounce some ideas around and get back to me. Last edited by Aosaw; 05-24-2018 at 10:19 AM. Quick question as I develop my character. How long has life been on Vaun? Are the inhabitants native to it or did they come from Mono? @pkeiter good question! Life has evolved on Vaun to what it is today. All inhabitants are native. Mono is a gas giant, so nothing lives on it. @daendil and aosaw, the School of Invention was what I was thinking of as well and would allow it. Last edited by figtickler; 05-24-2018 at 12:00 PM. I forgot to include class as an item in the app, most of you included it anyway. Sorry about that! @Aosaw: nice find. I didn't know about that school, but it seems pretty flavorful. Looks like the DM would allow it too. So I think I'll go with it. @figtickler: I'm not sure I understand the question. The flexible hand would be a way for me to fluff Mage Hand. I wouldn't attempt to grab a 2nd floor window frame with it and crane myself up (the fine mechanic parts wouldn't bear the weight anyway). Last edited by figtickler; 05-24-2018 at 01:47 PM. Last edited by Arthilian01; 05-24-2018 at 03:16 PM. Age: 30-ish, Stopped counting birthdays about that time. Appearance: Gantry stands around six feet tall and weighs in at a hundred and ninety pounds. He has shoulder length brown hair which he keeps swept back and behind his ears. His face is handsome and somewhat sculpted per his controlled selected lineage and bloodline with dark green eyes. Unfortunately in his older age, he is starting to show some wrinkles across his forehead and under his eyes from many nights spent otherwise awake. Due his perfectly selected lineage, he has broad shoulders and a somewhat heavy build but due to his training, he is lithe and toned rather than having bulging muscles from less-focused labor. He wears a single dangling, gold earring in his left ear that bears a spherical topaz. 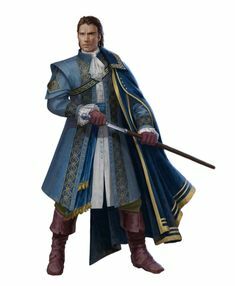 He prefers thick, heavy clothing in vibrant blues and golds in order to properly disguise his leather armor underneath. He always caries a cane, obviously not using it for more than a 'walking stick'. It bears about six inches of silver at the top with a spherical topaz head and the length is brown wood, polished to a sheen. Personality: Gantry is often cold and detached, always carrying himself with a royal bearing, his chin always somewhat upraised. Anyone looking at him can tell he comes from noble stock and raising. He is a driven individual, thriving to prove himself worth his family name and worth their allies, the Moonrise. Since the 'unfortunate' loss of several family members, He has to show that he can be useful and he has a devotion and loyalty to benefit his family's allies and in extension, his family. He almost never talks about his past or family, It's a good possibility that there is some secret that could jeopardize his family's place in society. Gantry was born into a controlled environment in the City of Yslip. His parents didn't love one another but were rather forced together for the sake of providing proper offspring. Gantry was one of the one hundred and fifteenth generation of the Bloodline Destroud and the fourth of his name, a position awarded only to the first born of each generation passed down from father to son and if they met the standards of the lineage, decided through an aptitude for physical and mental health standards. His father had been the third of his namesake and no one had held the name for a hundred years before, and thus, he was constantly reminded of his obligation to meet the standards. Growing up, his parents and grandparents demanded that he be vigorously trained in tests of mental and physical dexterity, as well as teaching him about his history and then in the arcane arts. By this time, The Moonrise were already fully ingrained and bound to the family Destroud and thus had their fingers in everything, demanding conditioning and reconditioning until loyalty and ability was instilled 'or else'. Through this rigorous lifestyle, Gantry became cold and detached, being shown minimal love from his parents in exchange for a benchmark that he had to meet at all costs. By the age of seventeen, He was inducted into the Crimson Brigade, A clandestine branch of military precision within the Moonrise ranks but was still considered a free asset and representative of his own house. The induction was not the end of it, though. As was per regulation, Destrouds that showed physical and mental capabilities like Gantry were trained as 'Seekers', individually dependent agents that used intelligence, arcane prowess, investigation and intimidation techniques to root out and 'handle' secret plots and conspiracies that posed possible threats to the Moonrise. Gantry trained hard to meet the new benchmark that would dictate his survival in the coming years, learning all he could and as quickly as possible before they deemed him unworthy. As he grew into an adult, he shows a cold and logical premeditation to his actions and life lived in the shadows and out. He was trained to realize and understand that every mission could be his last, Whether he meet his end at the hands of the enemy or at the hands of failure of the mission that otherwise didn't result in his death. Now, in his late adulthood, Gantry has been specially tasked to head up a group of freelance agents in order to investigate the mysterious and seemingly random acts of violence that have become a near constant within the city. He will play the part of liaison between the group and his contact within Moonrise, Darkfire Eldridge. The soft 'Clack, Clack' of his finely made leather boots and the 'tap' of his walking cane was the only sound that penetrated the thick darkness of the alleyway that Sir Gantry Lelouch Destroud the Fourth traversed to meet with his contact in his latest case. This part of the city was not his place, his noble dressage was far to close to the risk of getting soiled by the loose debris and dirt-caked walls of the narrow alleyway but alas, this was the price of his occupation, however forced it may be. He was to meet with a man by the name of Cutter, an alleged member of a resistance movement in Yslip that would someday pose a threat to Moonrise and this 'Cutter' was going to spill his guts to Gantry in exchange for immunity or some such. Only halfway down the long alley, Gantry stopped suddenly, planting his cane before him, both hands on the topaz head, as a figure stepped into view at the far end in the direction that the nobleman was walking. A huge figure that blocked nearly all the light beyond the end of the alleyway. The figure raised it's left hand with the first two fingers extended upwards and the other three curled into a fist, this was the signal that Gantry had given to the contact. Sir Gantry continued his stride, his can 'tap, tap' in between every third 'clack' of his boots. Once he had closed on the figure, he realized it was a large, strapping half-orc, nearly a head taller than the nobleman, 'Of course he would be a half-orc.' thought Sir Gantry as Cutter began speaking rapidly in a whisper, looking over his shoulder and all about nervously. Sir Gantry nodded as the Half-orc stopped talking, having revealed a ample amount of secrets about the resistance movement, including a location where the entirety of it's agents could be found. The nobleman pulled a rolled up parchment from inside his lavish coat with his left hand and offered it to the half-orc, Paperwork detailing a safehouse and a full pardon to Cutter in trade for the information to crush the rebellion. Presenting these to the proper authorities of the Crimson Brigade would see that Cutter would live out a long and happy life, dying of old age many years in the future. As the lumbering beast took the paperwork in his thick, green-skinned hands, Gantry didn't release them right away and when Cutter looked up to meet the nobleman's eyes, he caught the movements of his right hand completing the somatic component of a spell then heard the last words of an incantation being spoken and smelled the magical burning of rose petals as his lids started to became heavy. The lumbering half-orc crumpled into a pile on the cobbles of the alley, asleep. Sir Gantry drew forth the silver section of his walking cane to reveal a thin, shining blade as he bent forward towards Cutter's form, "Very well, Cutter." in his cold detached tone was the last thing the slumbering half-orc heard right before the rapier-like blade plunged through the side of Cutter's neck and 'shling' out the other side, throwing spatters of blood across the pavement. Last edited by Arthilian01; 05-24-2018 at 05:41 PM.